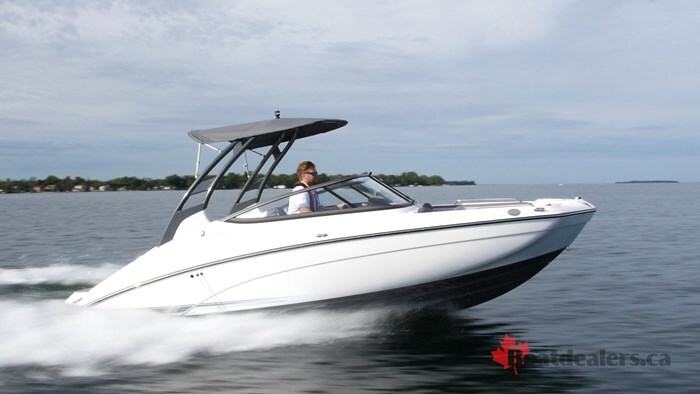 Yamaha’s 242 Limited S Sport Boat as far as I’m concerned helped put them on the map as a legitimate boat builder. What I mean by that is for a while jet or sport boats were always classified separately as such, they were always just considered jet boats. Yamaha however made a strong push to separate themselves from the pack, saying we build boats, that are powered by jets. The 242 Limited S featured best in class seating, storage, performance and comfort and has the awards to back it up. 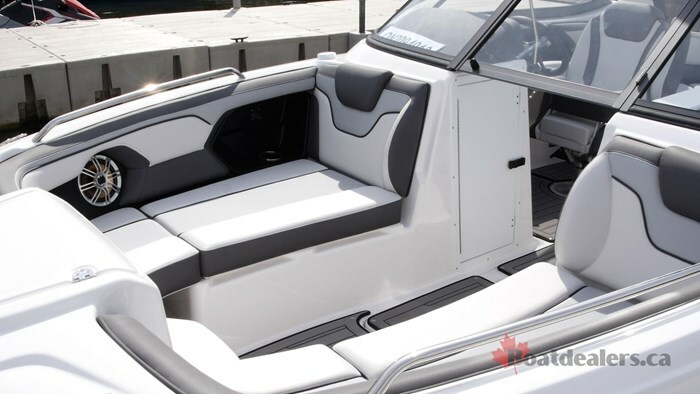 This makes it a perfect boat off of which to model for the brand new, reimagined 21-foot version, the 212 Limited S. Part of 4 new 21-foot models that were introduced in 2017, the Limited S 21-feet 3-inches of boating magic. If you didn’t know Yamaha made jet powered boats, you wouldn’t be able to figure it out when you walk up to it at the dock. The model I was set to test shone brightly in the late september sun thanks to the white hull, sides and deck yet was shaded in the cockpit thanks to the forward swept watersports tower that had a biminis. The aforementioned tower is standard on the Limited S series and what separates it from it’s 212 Limited sibling. The 212 LS was parked bow out at the dock, with the swim lounge proudly on display. It’s hard not to let this area catch your eye as it really is quite spectacular. 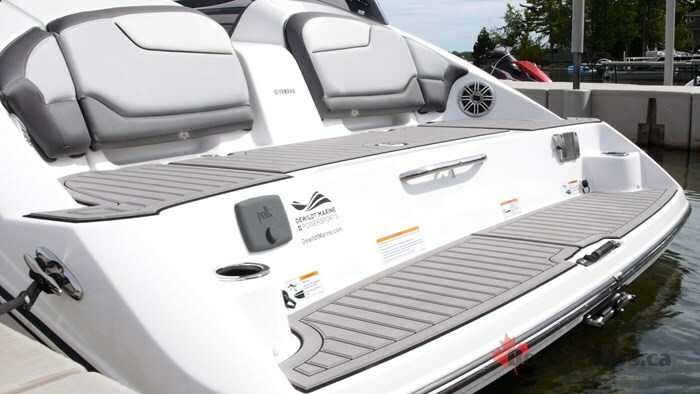 You have a swim platform that is practically flush with the waterline that blends into two-tier lounge area, complete with padded backrests, drink holders, table mounts speakers and stereo remote. It’s a regular party zone. This design has won Yamaha countless awards, however their nature is to constantly improve and for 2017 it’s been tweaked for the better, with increased space overall, and a small change here and there. It was so much so that I didn’t notice it right away, but when pointed out to me it all became clear. I think those are the best types of changes. The nature of the jet drive propulsion system along with Yamaha’s 1.8L motors is such that they can be mounted in the lowest part of the hull and not take up much volume overall. This is what allows them to create such a great transom lounge, along with the massive amounts of space in the cockpit. Even though this boat is 21-feet, it features the interior space of a 23-foot boat. The cockpit layout is a U shaped design that offers plenty of legroom and is accessible through a transom walk through. The irony being that even though the jet engines don’t take up much space, Yamaha gives you plenty of access to them as the entire back bench seat hinges up giving you access to the twin engines. The double irony of this (if that’s a thing?) is that you probably won’t need to access said engines very often, save regular maintenance, thanks to Yamaha’s legendary reliability. Underseat storage a plenty as the seats hinge up to be flat against the gunnels thanks to an innovative hinge design and there is additional storage to be found in the gunnels. The Captain and companion seats are high back premium chairs complete with arm rests and bolsters. For you tech fans out there you will be happy to know that the newly refined helm of the 212 LS comes with Yamaha’s Connext touchscreen and joystick system. 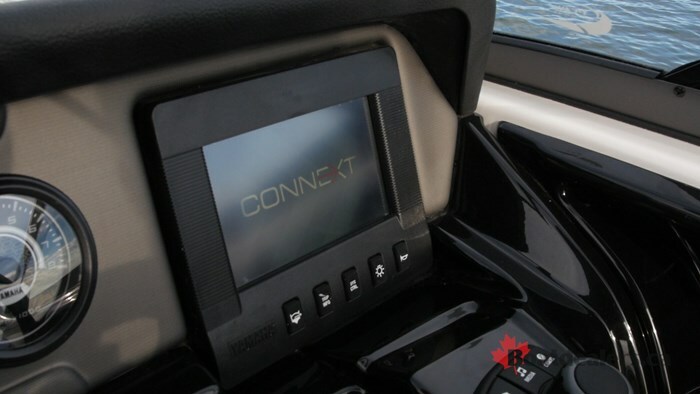 This system does it all as it houses all of your critical engine data including fuel consumption, but it’s also your entertainment center as you can connect your phone via bluetooth and play your favourite sand bar playlist. 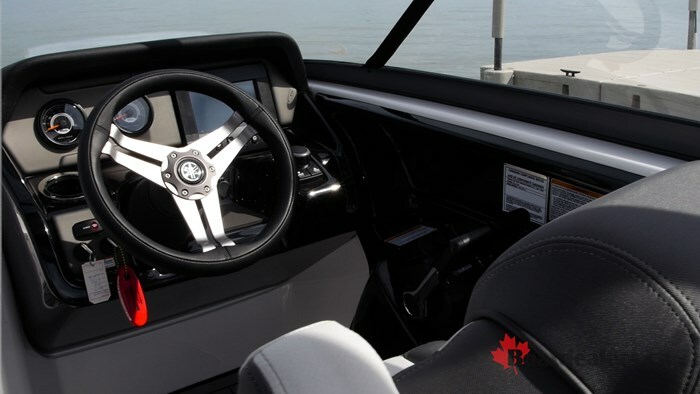 It features a really smart “float mode.” When you’re sitting with the tunes on and the engine off, the screen displays critical info like your battery voltage and water depth. Before you’re dead in the water though, the system sounds an alarm to let you know it’s time to turn on the boat and get a quick charge going. You don’t have to be a tech junkie though to operate this system. It’s quite intuitive whether you’re operating it by touch screen or joystick. Moving into the bow I was impressed with how Yamaha carried the beam of the boat as forward as they could before tapering, creating almost a rectangular shaped lounge. This lounge features two full length, forward facing lounges. When you lift up the seat bottoms they hinge up, completely perpendicular to give you full access to the storage underneath. 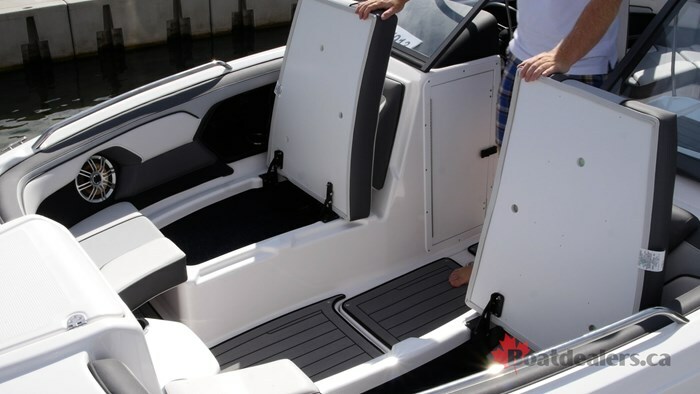 Something that has proven to be quite popular on Yamaha’s other Sport Boats that they made sure to include in this new incarnation of boats was their bow jump seats. A filler section for each lounge removes to give you a forward facing seat, right up at the very tip of the bow. This spot is a favourite of the kiddies as it gets them right up and in on the action. High bow sides and grab handles however give them plenty of safety while they are feeling the wind in their hair. Powering the 212 Limited S is a pair of high output 1.8L engines. Yamaha chooses not to publish the horsepower rating of their motors, but after a thorough water test of the 212 LS I can tell you it’s enough. The 212 LS was on plane in a little over 3 seconds when putting the throttles for the twin engines right down. The power hook up is immediate and quite impressive as you can feel the motors do their thing and push you back in your seat. The sight lines on the 212 Limited S are unobstructed, even when the bow lifts slightly when getting on plane. The 212 LS cruised nicely at 5000 rpm producing a speed of 18 mph then jumped to 27 mph at 5500 rpm. From there the speed increases were quite predictable, jumping to 32 mph at 6000 rpm. The power curve was quite steady with the twin 1.8L engines, producing snappy whole shots along with immediate acceleration through midrange throttle increases. Something that makes running the 212 Limited S easier, especially when it comes to watersports is Yamaha’s cruise assist program. Found on the Connext joystick are cruise up and cruise down bottoms. These either increase or reduce the RPMS of the engines by fractional amounts, resulting in subtle speed changes. This is great if you have a skier behind the boat at they give you the slow down signal. Instead of trying to nurse the throttle, you can hit the cruise down button and your speed will drop accordingly. 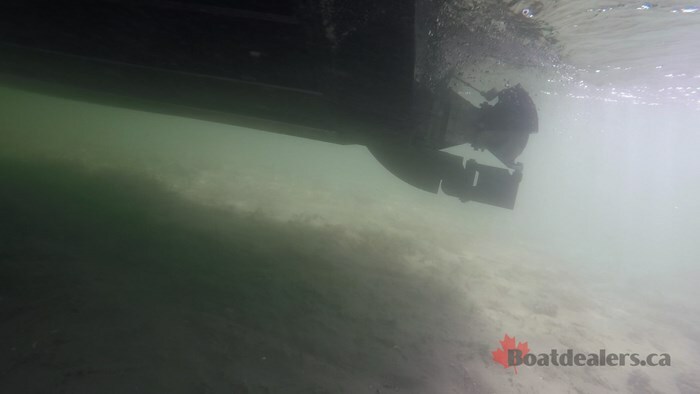 This is a small thing that can make a huge different in your overall boating experience. With the sun about to set I finished off with a couple top speed runs, both with and against the slight breeze we had on the lake that day and we averaged 50-mph. This is plenty of top end speed and it’s nice to know you have those extra ponies to work with should you have a boat full of people. I’ve always been impressed by Yamaha’s Sport Boats. They’re both fun and functional. They’re playful and practical. This new 21-foot version of the Limited S has big shoes to fill, but I think it is more than up to the challenge.